On May 1st, the East Hamilton rent strike began with tenants from more than 70 units withholding rent. On June 1st, that number doubled! 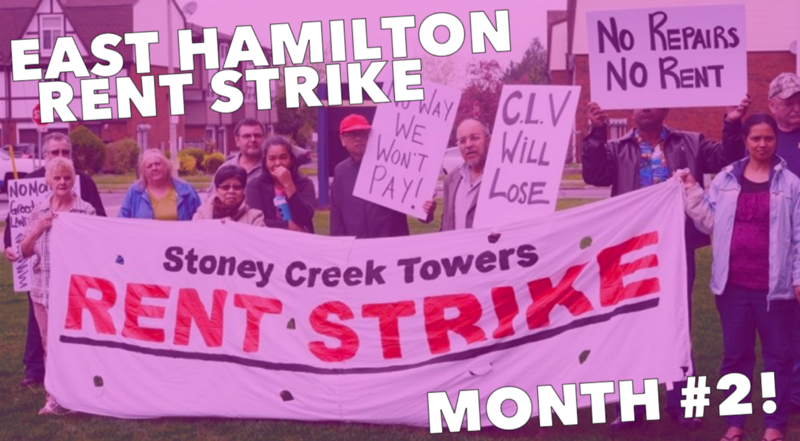 Congratulations to the Stoney Creek Towers rent strikers on entering the second month of the East Hamilton Rent Strike! On May 1st, the strike began with tenants from more than 70 units withholding rent. On June 1st, that number doubled! This is due to the hard work of the tenants, holding meetings in their buildings’ lobbies, knocking on their neighbours’ doors, making rounds of phone calls, and talking with their neighbours in the elevator, the laundry room, the parking lot, the school playground, the grocery store — all in an effort to calm people’s fears and convince them to join the strike. Stoney Creek Towers tenants realize that they have power when they act together. Tenants will continue to withhold rent until their landlord agrees to their demands: to withdraw the application for an Above Guideline rent Increase (AGI) and to make longstanding repairs to their units. The strike is working! Already, the property management company, CLV, and its parent company, the landlord, InterRent REIT, have begun making repairs to tenants’ units. Before when tenants called the office or submitted work orders documenting the need for repairs, their requests were ignored. For years, tenants have been contending with drafty windows, faulty heating systems, pest infestations, broken appliances (including stoves and fridges), unreliable elevators, peeling floors, cracks and holes in walls, peeling tub surrounds, leaks, and mould. Due to the financial pressure of the rent strike and the negative media attention, the landlord is finally making unit inspections and scheduling repairs. Stoney Creek Towers tenants are happy, but know that they need to keep the pressure up to make sure the landlord follows through on its promises. Veronica, 90 years old, has lived in her apartment for 35 years. She lived through the winter with a piece of plywood for a window, suffering through many cold drafts. She is demanding that her landlord treat her with respect and repair her window. Veronica is one of many tenants who rallied on May 15, 2018 to demand that their landlord make longstanding, necessary repairs to their units. Tenants delivered a large stack of work orders on behalf of all of the rent striking tenants to the property management company, CLV’s, office. While this rally took place well within official office hours, when tenants went to deliver the work orders they were met with locked doors. CLV seemed to think that if they pretended the office was closed and ignored the tenants, this would make the problem go away. It didn’t. After a while, CLV eventually realized how bad this looked, and agreed to accept the repair letters. Behind the closed doors of the office, we could see them on the phone — presumably to get instructions from the higher-ups in their Ottawa headquarters — and proceeding to photocopy all of the repair letters. Tenants think it is outrageous that they are being asked to pay for a large above-guideline rent increase to cover the cost of cosmetic upgrades to the buildings, meanwhile requests for necessary repairs to their units are being ignored by their landlord. When tenants organize and fight back, landlords take notice. During the first month of the strike, the landlord tried to intimidate the tenants and undermine the strike in several different ways. InterRent/CLV sent out notices intended to scare tenants into paying rent. InterRent/CLV offered to make repairs to tenants’ units in exchange for dropping out of the strike. InterRent/CLV even flew down some of their top executives from the head office in Ottawa to knock on rent strikers’ doors, harassing tenants and demanding rent. In each case, the landlord targeted leaders of the rent strike or tenants perceived to be vulnerable, including immigrant tenants and elderly tenants. In each case, tenants weren’t fooled! Due to the good work of the tenant committee, tenants know they can knock on their neighbours’ doors or call each other up and tenants will rally to support each other and have each other’s backs. Stoney Creek Towers tenants have some great ideas for how to increase the pressure on their landlord in June. Please stay tuned for upcoming rallies and actions and ways you can help! In the mean time, consider donating to the Rent Strike Defense Fund. When tenants withhold rent in protest, landlords will often respond by issuing eviction notices. Tenants have been setting their rent money aside and are prepared to pay what they owe, should it come to this. Nevertheless, in Ontario, the Landlord and Tenant Board requires the tenant to pay the landlord’s eviction filing fee ($190 per tenant). Tenants should not be penalized for participating in the rent strike. The Rent Strike Defense Fund ensures tenants are not burdened with this cost. It shows support and emboldens more tenants to join the strike. Any donation will be greatly appreciated and every little bit helps. Whatever is left of the fund after the successful conclusion of the strike will be used as a general rent strike defense fund for tenants across Hamilton. Due to the financial pressure of the rent strike and the negative media attention, the landlord is finally making unit inspections and scheduling repairs. Stoney Creek Towers tenants are happy, but know that they need to keep the pressure up to make sure the landlord follows through on its promises.